You are here: Home / Prom & Wedding Season Close at Hand! Don’t Forget the Alterations!! 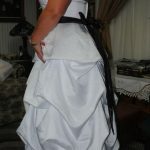 Prom & Wedding Season Close at Hand – Don’t forget the Alterations!! Prom season is close at hand!! Weddings are being planned!! For those purchasing gowns, one expense that needs to be consider is the cost of alterations. No, don’t shrug this off. 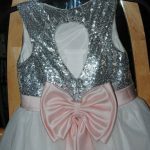 If you want a seamstress who specializes and treats you well with knowledge in how to make your dress look like it was made just for you, it will not be cheap.I have read a few blogs where people are sharing that alterations are quick and inexpensive. Okay, there are some people who are quick, and there are some people who are inexpensive. Some of these people are extremely talented in their skills. But, this is not always the case. Those who are a bit more, are usually those who are aware of their time and overhead costs, healthcare costs and actually pay their taxes. Yes, just because it appears we love our jobs (and most of us do), it does not mean it is a hobby. It is a job, just like the job you might have, where you get a pay-check every two weeks or more. Yes, some gowns can cost no more than $50-$75 to have altered. I’ve done this for prom, bridesmaid and bridal gowns. But, that is only because the wearer purchased a gown that needed a minimum amount of work. Even the fitting didn’t cost her much! I have one client who both times arrived (once for her wedding and again as a bridesmaid) and only needed a minor alteration in the bodice to be done. The dress was made to fit her, in both length and in size, yet she needed the shoulders brought down for her or the back taken in. She didn’t have bling on her classic dress, which made it a sheer joy to share with her what her estimate was. I always require a minimum deposit, and her estimate never totaled that amount. Most often though, since gowns are being purchased off the rack (OTR), the hem will need to be taken up as most gowns have a hem length to fit a 5′ 7″ height. Depending on the type of gown and how many layers underneath, this will be your most expensive outlay of cash. Some fabric options that can be pricy to alter are your lace, beaded, sequin and chiffon fabrics. Why? Because they are the most challenging to work with, requiring extra attention and time for your alteration needs. Chiffon alone has it’s own personality, where when I work with it, after the client leaves, I let it hang for a day or until it is ready to work on, then I cut it, then I let it hang for a day or two or three more 🙂 When a seamstress measures the hem of a chiffon dress, the weight of the clips holding the marking in place actually weighs the fabric down, making it seem “longer”, when in reality, once those clips are released, that fabric springs back to its happy place. Once chiffon is cut, it has a hissy fit!! Seriously!! It has no idea what was done to it, and wants to get its emotions out, where it needs that special time out!! Trust me, I don’t mess with emotional girls (I raised three daughters) nor emotional fabric, I walk away and let them settle down. 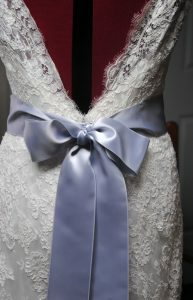 So, please be kind, and let your talented seamstress work her/his magic for your special day. If your gown is elegant and fancy like some princess bridal gowns with very elegant lace, with glittery glamour, you could be looking at a very pricy alteration for hems, adjustments to the bodice, etc. There is nothing wrong with these gowns. I absolutely LOVE working with these beauties, but I make no mistake in sharing, they can be pricy. They can be the ones that make a girl feel like a princess!! And, being one to enjoy lace and elegance, I don’t think there is anything wrong with wanting that. I have even had single dad’s purchase these gowns for their high school, senior daughters, for their proms. They want their daughter to look and feel like a princess. But…. 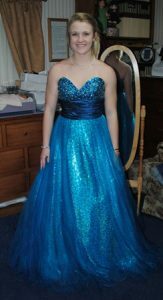 there is a cost.So, for girls getting their prom dresses, and on a part-time job budget, or in a family where money is a matter of one needing to be frugal, I would “recommend” considering this when you select your gown. Consider a swap session at your high school, where each of you bring your gowns from prior events to trade with someone else. One way to save, if this is the type dress you desire, is to go to a used dress shop, and try gowns on there. Many will already have been altered, so you might enjoy your dream dress without any needed alterations, or possibly just a few simple adjustments in the back to fit your torso (bodice area). Please be mindful, that if you shop at Goodwill or Salvation Army, those gowns will have dirt or other type stains, that even dry cleaning might not be able to take out. By the way, when I share that one might need to be frugal, that does not mean to be cheap. Cheap gowns are simply that. Cheap!! I had one girl come through, and the beads were falling off everywhere. Some gowns stink of some sort of chemical due to their inexpensive fabric. Some fabrics tear due to their poor quality. These gowns are ones where a seamstress calls in her night flock of elves to help her out, allowing her the magic needed to make them look beautiful, creating a smile of beauty when the wearer puts it on. Brides, there is a lot to consider when planning for your special day. Your gown represents you and your personal style. The goal is to make your groom shed a tear in knowing that YOU, the girl walking down that aisle, is the woman that he alone gets to enjoy for the rest of his life. This is your “WOW HIM” moment. This does not mean buy the most expensive dress, but rather purchase the gown that makes you feel beautiful, whether expensive or not. Your glow will make him realize you are the gift of his dreams. Okay, I get a little sappy. I’m romantic and have been with my “one and only” for over 40 years, and married for 38 years this upcoming May. I believe in romance, in being true to my man, in honoring and respecting him with as much love as my heart can handle. Yet, I also believe when we give our best with love and honor, we receive it in return. I’ve been fortunate in that my belief is also my reality. So, if I get a little sappy from time to time, well, that’s because I can sometimes get a little wishy washy when I think of my husband. Best deal, is to find a dress that fits you the way you want it to fit. Try to find a gown that needs the least amount of alterations, if any at all. A dress off the rack, for $125-200 with no need for alterations, will actually save you money AND time if you don’t need alterations!! Do I like to alter gowns? Yes!! Do I like to see your wallet shrink in shock?? No!! Do I like to see a client leave with a smile of happiness and delight?? Absolutely!! Having a specialist alter your gown, is like having your car entrusted to a mechanic. You reach out to them to do what they know best. Affording it might make you uncomfortable, it might even make your wallet squeal in fear, but you trust them for the quality work that they can provide. The rate is for their time, their overhead, insurance, taxes, but more importantly, their skills. Most of us would love to do this for free, but that would defeat the purpose of being in business to serve you. So, if your budget is limited, find out what needs to be done, ask if there is something that could help you save money. Sometimes simply adding an inch to your heels will prevent a costly hem alteration. Sometimes adding bra cups will prevent one from needing an adjustment on the sides or back. It all depends on how your dress fits, and your communication with your seamstress. When I call my mechanic, he can’t always give me a “quote”, but an estimate tells me if now is the time I can go in and have some work done. My inspection, requires some work to be done, that hits the budget line first. Then, if needed/recommended, I receive a list of what needs to be done within a few months or before my next inspection. This helps me plan. So, plan when you shop, try to find the dress that best fits you, and if you find your dream dress that will need tons of work, understand it will also need plenty of resources in order to compensate your seamstress for their time. A dress shop that clips your dress in back to make the dress look amazing and then tell you, all it takes is a few simple adjustments should raise a red flag. Ask them how much they pulling together. Is it a one size adjustment or six? Sometimes this makes the illusion it is a simple fix, when it might not be. 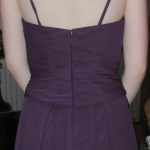 You find a dress that is too small, but the dress shop tells you, you can add a simple corset in the back!! This works in some cases, in others, there is more to consider if you need a lot to make it fit without it making it pucker on your derrière. Yes, corsets can be added to dresses that have zipper backs, but it is not a simple adjustment, and fabric has to be purchased and matched. A dress shop that tells you that your bodice can be made into a sweetheart bodice. I really wish they would not tell girls this. It can be done, but personally, I won’t do them. 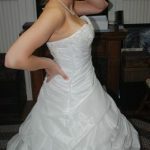 There are plenty of sweetheart bodice dresses to choose from, why spend money to recreate your dress? Lace hem dresses. Please know, these are expensive to alter, as they will need the lace removed from the hem, or taken up at the waist if the lace is not able to be removed. 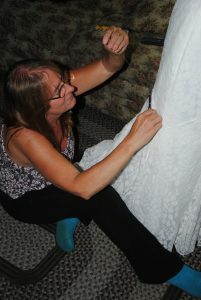 Removing and replacing the lace from the hem is tedious and often times intensive hand work. Adjusting the waist is a lot of work as well. Finding a dress on clearance, with a broken zipper, yet is exactly what you want and fits you perfectly!! Bring it in!! A $75 (or more) zipper replacement is far less costly than some options. 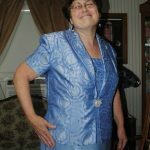 Your mom’s or grandmothers gown refashioned: These are sentimental, and although sometimes expensive, they can sometimes be the least costly and one of my most favorite consigned jobs! Consider tea length, it saves a bundle on hemming!! Just find a dress that fits you well, with maybe a few minor tweaks. By the way, a tea length dress works wonders for a height deprived gal. 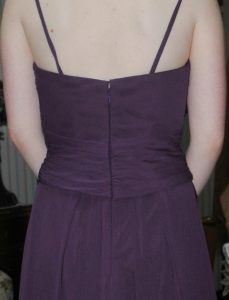 No hemming resulting in a full length dress. SCORE! You love the dress, you love the fit, but you want the strapless dress to have straps. Many shops sell strap like sleeves and sometimes a lace or beaded trim can do what you want it to do. 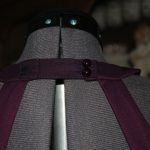 It would be helpful, and save you money, if you purchased the trim yourself, instead of hiring your seamstress to do this for you, then bring it along to your fitting. Too much cleavage? Modesty panels provide coverage at a reasonable cost. Check around. If you are not too worried about intricate details, there are a variety of seamstresses available. Some do quick fixes, others take care of the small details. It is all about your needs, your budget, and what can be done to meet them both!! One thing to consider when purchasing your gown: Can it later be shorten to become a dress to be worn to a dinner party or elegant night out? If so, since your dress already fits you, after its initial use at a wedding or prom, consider having your seamstress shorten it for future wear. NOTE: Although I do provide alterations and mending, an area in which I personally specialize, is that of heirloom sewing. I can repurpose your gown (and other garments) into memory quilts and pillows, Christening gowns, christening blankets, miniature replica’s and will consider what your imagination provides. 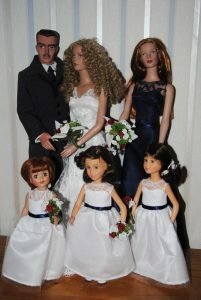 I create miniature replica’s to fit various fashion dolls, to put in shadow boxes or on display. 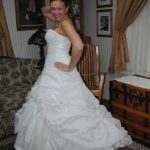 I shorten formal and everyday dresses/gowns, change hemlines, restyle, etc. Regular, everyday wear clothing, has been made into baby coverup capes that allow one to strap their child safely into their carseat, memory pillows, quilts, totes, aprons, and more. Hopefully I have given you some insight with some helpful tips. My goal is to see you enjoy your special event knowing your gown fits you well. NOTE: All pictures are the work of and are the property of Davina Dawn Sewing Specialties.